The latest Good Food Guide was released in August to the news that Nathan Outlaw’s eponymous restaurant in Cornwall had topped the rankings. Much debate can be had about the validity of any list of this sort, food is ultimately an art and subjective. That said guides like this, Michelin and The World’s 50 Best will continue to exist and thrive. People love a list. The top 10 on this guide contained 8 restaurants I have been to as well as a number more. I also happened to be at Nathan Outlaw the week before the guide was released so should have a good objective view on that verdict. It was my third visit to Nathan Outlaw over the space of 5 years but on each I felt like I was a regular, the service is the perfect balance between that friendly touch and still befitting of their 2 Michelin stars. The front of house is literally a family affair with a husband and wife the sommelier and restaurant manager respectively and there is a genuine warmth that you would struggle to emulate. The setting is also sublime, perched above the picturesque Port Isaac it’s a small dining room with only a handful of tables. Its modern and mostly clad in hefty wood with each spot in the restaurant offering views across the headlands and out to the Atlantic Ocean. That costal connection is what Nathan is famous for, his reputation is as the foremost seafood chef in the country. The 8 course tasting menu (£125) features only fish and shellfish for the first 5 savoury courses followed by cheese and desserts. This is the only menu for dinner and it can vary daily depending on the catch. There is a reduced lunch menu at £62 but it does contain many of the headline dishes from the evening so no shortcuts or cheaper dishes like some restaurants. The two courses to kick things off were very good, a subtle, firstly a stunningly fresh cured monkfish which contrasted with a smoky, rich mackerel pate that was silky smooth. The next 3 courses delivered the best succession of dishes I think I have eaten. A bold claim given my fine dining resume. The first of these was lobster, local lobster of course and so local that you can see the fisherman’s (Callum) pots from that amazing view. With produce this fresh and excellent it can be dangerous to do much to it and I was a little surprised to see the shellfish paired with the bold ingredients of ginger and chilli. 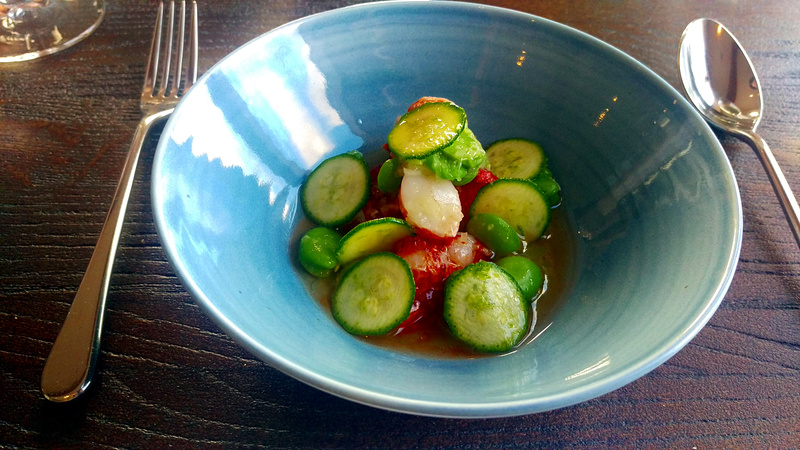 In reality the Asian influence provided a background warmth and clear, clean flavours that complimented the lobster’s natural flavour. Since my last visit the next dish, or variations upon it, had entered into folklore. I told anyone who would listen about Porthilly sauce. I did to the extent that I wondered whether it would live up to my own hype. It was possibly even better, the best sauce I have ever eaten. It extacts every bit of flavour out of the local Porthilly crabs and is deeply coloured and rich on the palate, almost like a bisque. The red mullet was a perfectly cooked foil, though in truth you could enjoy most things with this sauce and I make no apologies for mopping it up with some bread. The main course was one of the most sought-after fishes and a personal favourite of mine, turbot. Whilst it is a meatier fish than most the flavours of bacon, leek and mushroom are still quite a bold combination. The bacon was in the form of a silky smooth puree that still let the turbot shine alongside the simple vegetables. The desserts don’t quite meet the dizzy heights of the savoury dishes, but it would have been very hard to. They were still of a high standard, the first a fresh combination of strawberry and elderflower with some light shortbread. The sort of thing that you enjoy on a warm late summers evening but won’t be in the memory banks too long. The final course was a little more refined, a chocolate and almond tart with raspberries. Classic flavours, well executed with a satisfying dark chocolatey end to the meal. The food I enjoyed at this meal is certainly amongst the best in the country, it amongst the best I have ever had. The fish is simply stunning and the connection with its beautiful costal surroundings certainly adds to the experience. It is a fine line between doing to much to a fantastic product but enough to elevate it to the heights of 2 star fine dining, the balance here is perfect. I have barely mentioned the wine pairings that were excellent and described in passionate detail by the sommelier. The service was equally fantastic. The Michelin guide defines its 2 star award as “Excellent Cooking, worth a detour”. It is quite a detour to Port Issac but it is truly worth it.